At the Red Tail Catering Company we believe in great food! After all, that's the whole purpose of what we are trying to do. We have partnered with North County's top farmers and purveyors to produce a wholesome and fresh cuisine that will not be matched. This, along with a commitment to superior service has made Red Tail Catering one of the fastest moving catering companies in North County. 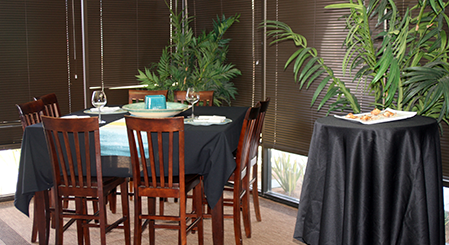 We have an eco-friendly, state-of-the-art kitchen to go along with our beautiful tasting room in San Marcos. Hormone free meats, free-range poultry and sustainable seafood products are all we serve on our original menus. Whether it is a classic buffet or a trendsetting custom menu, the Red Tail Catering Company will design a one of a kind experience for you and your guests! Chef James Stewart was raised in North Carolina by a mother, whom he calls "the best chef I ever saw." "We were originally from St. Louis so I got a mixed education early on with Midwest classics and Southern cooking," says Chef James. 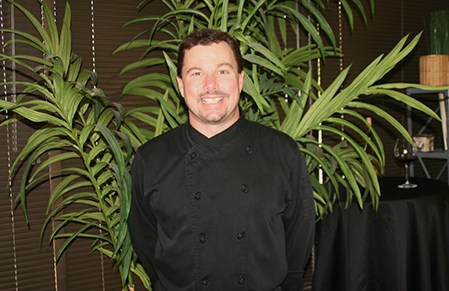 While in College, Chef James began his culinary career at Bennigans, an Irish Tavern in Wilmington, NC. It was during this time, that Chef James found his true calling. After moving to San Diego in 1992, Chef James attended and graduated from The California Culinary Academy in San Francisco in 1995. Returning to San Diego, Chef James became a Sous Chef with the TS Company at Jakes in Del Mar, Hula Grill Maui and Keoki's Paradise, Kauai. After returning to San Diego, Chef James became the Sous Chef at Sycuan Casino and then the Catering Chef at Morgan Run Resort. In 2009 Chef James joined the Wild Thyme Company as a Chef and then as Operations Manager, where he learned the Service aspect of the Catering business. During this time, Chef James joined the Cohn Restaurant Group at Vintana Wine and Dine in San Marcos. In February of 2014 Chef James Stewart started the Red Tail Catering Company. The Red Tail Hawk has a very special meaning in the local Indian culture. The Indians believe the Hawk is a messenger between Man and the Heavens carrying amazing powers of sight and awareness. The Red Tail Catering Company has chosen this unique animal as our company logo for these reasons. Our objective is to soar high above all others, while staying connected to the ground and keeping a keen vision of the present and future. Our Mission is to provide a superior product with exceptional customer service. By keeping the company streamlined and efficient, we intend to keep our costs to a minimum, therefore producing a high end product for a very competitive price.